Using the 'cheater' method I attached some pretty blue ribbon to the base layer of the card front. I used my Zig 2 way glue pen to adhere everything together. and to finish I used Glossy Accents to make the flowers really pop. In retrospect I wish I had used a lighter shade of green for the background, I still think it works I just wish the words stood out a little more. Maybe I could coat them with Glossy Accents . . . Crafty Ann's challenge #61 - spring into Spring! patterned paper also bought last Oct. Totally Gorjuss challenge challenge #123 - Spring! This is so very beautiful, I love it BittyKitty!! Thx for joining us at our very first MilkCoffee challenge and hope to see you again! 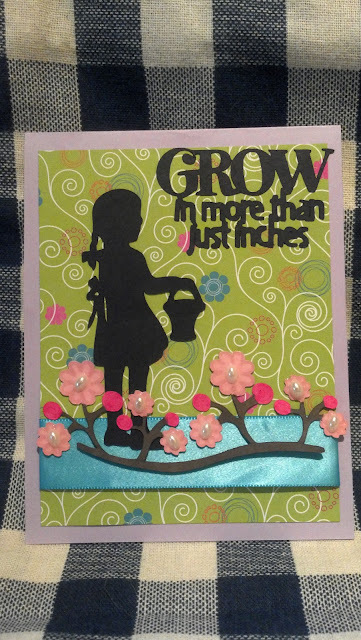 This is a lovely project, Rachel - I like the silhouette of the little girl and your flower border. Adorable Spring Birthday Card, thanks so much for playing with us at Simply Create Too & the CCCB. super cute.love the spring feeling.This is one of my top carts.Love the border of flowers.Thanks for joining us at milk coffee stamps first challenge.Hope to see you soon again. Beautiful card, love the silhouette images on a child's year cartridge. Lovely colours. Thanks for joining us this month at Crafty Calendar Challenges. This is a pretty silhouette card, love the elements in the bg... Thank you for joining in MCS first challenge and good luck to you too! Card. Thanks for playing with us ay Simply Create Too. Erica (Simply Create Too Design Team. A very cute card. Thanks for joining at Just Some Lines. Such a cute card and thanks for playing along with Really Reasonable Ribbon challenge! Very sweet card, Love the little girl silhouette. Beautiful! Thanks for sharing with us at Crafter's Cafe Challenge Blog! So cute! Love the silhouette! Thanks for playing at Wags N Whiskers! Rachel: wonderful Spring card--love your silhouette. Thank you for entering Simply Create Too's Challenge #9--"It's Spring???" Don't forget: Our new challenge begins this coming Friday. How pretty! Thank you for playing with us at The Crafter's Cafe Challenge Blog! Best of luck in the draw! Super cute card!!! Thank you for entering Dilo En Espanol!